(T4 , levothyroxine) sodium or triiodothyronine (T3 , liothyronine) sodium or both. T4 and T3 are produced in the human thyroid gland by the iodination and coupling of the amino acid tyrosine. T4 contains four iodine atoms and is formed by the coupling of two molecules of diiodotyrosine (DIT). T3 contains three atoms of iodine and is formed by the coupling of one molecule of DIT with one molecule of monoiodotyrosine (MIT). Both hormones are stored in the thyroid colloid as thyroglobulin. Thyroid hormone preparations belong to two categories: (1) natural hormonal preparations derived from animal thyroid, and (2) synthetic preparations. Natural preparations include desiccated thyroid and thyroglobulin. Desiccated thyroid is derived from domesticated animals that are used for food by man (either beef or hog thyroid), and thyroglobulin is derived from thyroid glands of the hog. The United States Pharmacopeia (USP) has standardized the total iodine content of natural preparations. Thyroid USP contains not less than (NLT) 0.17 percent and not more than (NMT) 0.23 percent iodine, and thyroglobulin contains not less than (NLT) 0.7 percent of organically bound iodine. Iodine content is only an indirect indicator of true hormonal biologic activity. 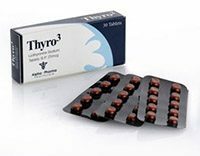 T3-Cytomel (liothyronine sodium) Tablets contain liothyronine (L-triiodothyronine or LT3 ), a synthetic form of a natural thyroid hormone, and is available as the sodium salt. The structural and empirical formulas and molecular weight of liothyronine sodium are given below. L-Tyrosine, O -(4-hydroxy-3-iodophenyl)-3,5-diiodo-, monosodium salt Twenty-five mcg of liothyronine is equivalent to approximately 1 grain of desiccated thyroid or thyroglobulin and 0.1 mg of L-thyroxine.